My cats love grass and catnip and not much else in the way of greens. I’ve thought about growing catnip… might as well give it a try! I grow it outside (where they can’t get at it) here as the cats have a habit of lying on small plants and killing them. Occasionally I will find a stoned stray zonked out. 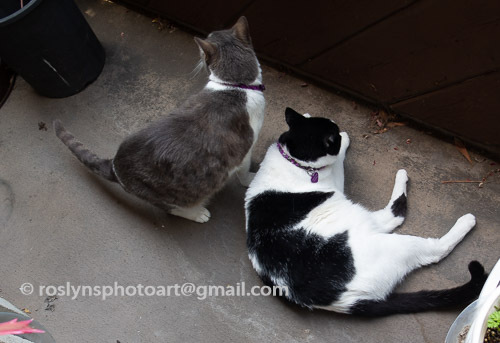 Then probably not a good idea for me as my two outside spaces (front balcony and top deck) are both accessible by the cats… although a zonked out Frankie may not be such a bad idea! Lovely cats. Cats are always worth for photographing. Thank you! When you can get them to cooperate it’s worth it! Thanks Chris. Covering the little plants with a plastic bottle is a good idea… like a greenhouse effect. 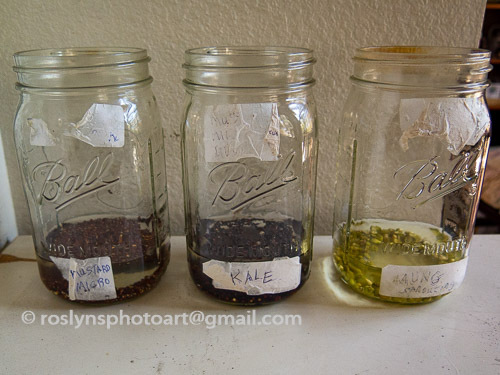 I now start my seeds that way when I first put them in the soil I cover them with a lid to keep them warm. Who is chewing down your seedlings. Bugs or a certain black cat?! 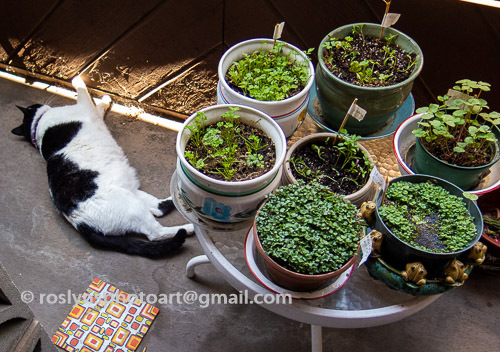 I can’t grow my micro greens in flat trays as you are supposed to because my cats confuse the trays with litter boxes… that’s why I grow everything in flower pots! You have to be flexible when cats are around! Thank you so much… glad you think so! 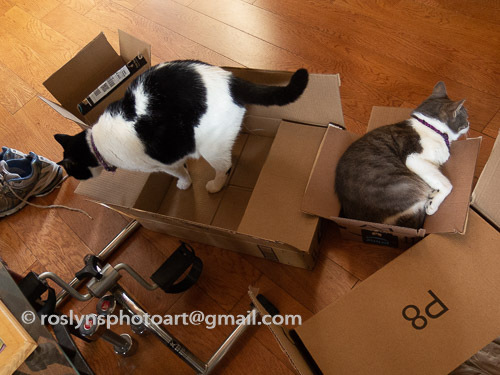 Looks like a fun day, since they didn’t have to share the boxes. No matter how many times you snap your fingers or make funny noises, they refuse to look at you! Next time they snap their paws at me I will refuse to look and see how they like it! My cat sat in one box till it was totally flattened, then just sat on the cardboard even though another box was available. I guess that first one was just a good box. I got my daughter’s cat some catnip, and it made it sick. I put the pot on the front porch and the neighborhood cat’s had a party that night. The pot was broken and the plant and dirt strewn over the whole porch. When you find a good box it’s hard to let it go! That’s why I’m afraid to grow catnip plants… don’t want to deal with the consequences! 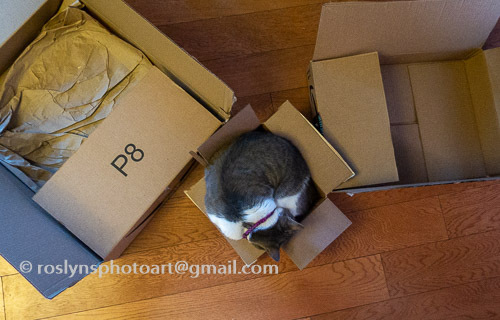 Cats are so cute with their boxes. My kitten has already adopted two, one for hiding (on its side) and one for napping. My 17-yr. old kitty likes to shred the edges of hers! Cats and boxes go together. I’ve had some boxes destroyed but i just tape them up and use them to take stuff to Goodwill. Aha, a new industry for amazon to dominate! Adorable little ones-definitely known what they like! 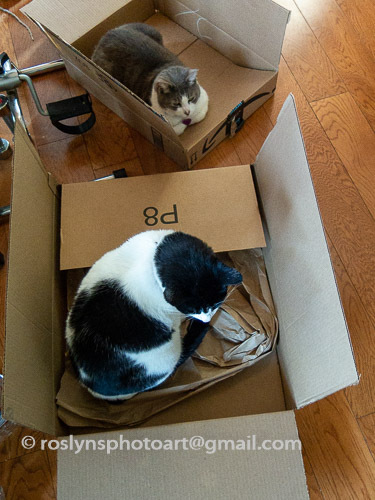 Don’t know what I would do without Amazon… I’d have to actually go out and buy boxes for the cats! Lovely models you have. It must be so fun photographing them. It’s fun sometimes but mostly frustrating when they won’t cooperate! Haha. Better to have more and more patience. I love the inappropriately sized box – too cute! Frankie probably thought it was appropriate… you know how cats are! Loved your whimsical tenants and your microgarden,Roslyn.Thank you for the interesting link.The nutritional value of those little plants is incredible.They do flourish now,but do you have to take them indoors when it is cold?Btw,do the boys ever bicker when they have to share something?They seem to be getting along fine. 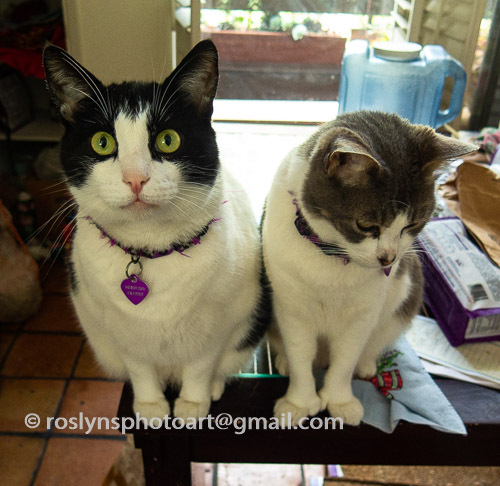 it doesn’t really get cold enough in Culver City to have to bring them indoors…. the problem is the heat. They shrivel up and die if the sun is too much. The boys don’t bicker. If Frankie wants something he pushes Freddie out of the way and that is that! I know,hot sun makes them look scorched.Does Freddie do the same?I mean,does he push Frankie if he wants something?